Flambeau River Papers has been a major force of the economy for the city of Park Falls, a small town in northern Wisconsin with a population of roughly 2,262.2 Originally opened in 1896, the mill has been one of the largest employers of Prince County in Wisconsin, producing a variety of paper products, such as printing, cover stock, tag, reply card, index, freesheet, envelope, and laser bond paper. Park Falls was thus hit hard when Flambeau River had to shut down its mill in 2006 due to its exorbitant energy costs and antiquated machinery. The mill’s closure had left approximately 13.2 percent of the city’s residents unemployed. Flambeau River, however, received a fresh lease on life under a new ownership led by Butch Johnson. All its previous employees were offered their jobs back at the same salary and benefits prior to the mill’s closing, an offer which was accepted by approximately 92.0 percent of them.3 The reopening of the mill also provided a unique opportunity to revise the company’s business model and identify what needed to be in place for the company to thrive. Pulp and paper mills, traditionally large consumers of energy in the United States, are affected by rising energy costs if their processes are not using modern standards of efficiency and are heavily dependent on fossil fuels. In 2006, paper mills throughout the United States consumed 2,354 trillion Btu of energy, approximately 11 percent of total energy consumed by the entire U.S. manufacturing industry.4 Between 2002 and 2006, the average industrial electricity price in Wisconsin rose 18.7 percent from $.0493 to $.0585 per kilowatt hour (Figure 1),5 while the average industrial natural gas price rose from $5.23 to $9.40 per thousand cubic feet—a much steeper increase of 79.7 percent (Figure 2).6 The climbing energy prices heavily impacted the operational costs of Flambeau River Papers. Prior to the Flambeau River plant’s bankruptcy and closing in 2006, the plant consumed 1.3 trillion Btu in 2005 from fossil fuel. Although down significantly from the 1.5 trillion Btu from fossil fuel consumed the prior year, the mill’s energy consumption, coupled with skyrocketing electricity and natural gas prices, had a severe impact on the plant. The company was spending $11.0 million on energy.7 Controlling energy bills was thus a priority when the company came under new management after its purchase. Once the plant reopened and stabilized, Flambeau River Papers established energy efficiency and fossil-fuel-independence goals for the company and devised an energy management plan to ensure that these goals are met. In shaping its plan, the company management sought advice from employees for what could be done to improve the company’s energy situation and profitability. The company aims to achieve its goals through energy trending, fuel switch, and continual process improvements. Most importantly, the company management decided to take a bottom-up approach, encouraging recommendations from plant-level staff for improved operations. The company believes that its goals will only be met if every employee commits to making energy efficiency a priority and through education. Based on the input received and other factors, the company’s Energy Committee updates a project prioritization spreadsheet each month—a tool that the plant uses to determine which energy efficiency improvements to implement next.8 As an Energy Committee rule, a minimum of 10 projects are on the prioritization list at all times, and committee members must identify funding sources for six projects while trying to have at least three projects going at any given time. Further, in an effort to be energy independent, the company also plans for a biorefinery to come online by 2013. The company estimates the plant will consume 660 billion Btu from fossil fuels in 2009. The planned biorefinery is expected to produce 8.0 million gallons of Fischer-Tropsch mid-distillate, “green diesel,” and 8.0 million gallons of paraffinic wax each year that can be sold for candles and box lining among other uses. The green diesel will be sold for blending or “as is” use during warmer months. Flambeau River’s energy management approach has been paying off in expanding the mill’s operations ever since. It has enabled the company to maintain a steady annual energy cost while increasing its production 11.9 percent from 135,000 to 151,000 tons of paper each year.9 These measures have also led to reduced labor costs. Additionally, the company estimates to grow from its current 315 employees to 355 when its planned biorefinery comes online in 2013.10 The biorefinery will also serve an emissions goal set by the company—to make the mill carbon neutral by 2013. To help with the plant’s transformation, Flambeau River participated in August 2007 in an ESA. ESAs are a valuable resource for manufacturers provided by ITP to help identify ways plants can consume energy more effectively. 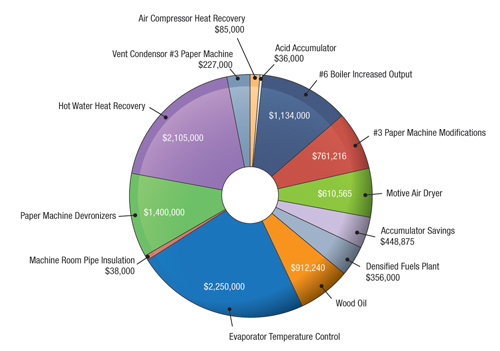 At the time of its ESA, the company was most concerned with reducing its natural gas consumption and opted to participate in a 3-day steam assessment of its natural gas boiler. The Energy Expert used a two-part process to complete the ESA. First, ITP’s Steam System Scoping Tool was used to profile and score steam system operations. The plant’s steam system scored 65.3 percent, which is rated as average. Next, the Steam System Assessment Tool was utilized to analyze potential energy and cost savings if the plant managers were to implement certain recommendations. The ESA had identified several near- and mid-term opportunities (near-term is less than 2 years and mid-term is 2 to 4 years) to improve the plant’s steam system efficiency. The plant weighed all the recommendations in consultation with Focus on Energy, a state-based program that provides resources for energy efficiency projects, and decided to implement the following measures. The mill has improved its efficiency through the purchase, installation, and use of variable frequency drives, new pumps, lighting upgrades, and process improvements in the plant’s steam systems. The plant has also implemented heat recovery systems through the hood exhaust in the mill and biomass dryer and stack in the boiler house. Management implemented the hot water heat recovery system and installed pipe rerouting projects first because they required a plant shutdown. This action proved to be very economical because these projects were implemented before the employees came back to work. The mill has traditionally been heavily reliant on fossil fuels to meet the plant’s energy needs. However, Flambeau River Papers is steadily moving toward its commitment to reduce fossil fuel consumption each year until 2013 when the company aims to become energy independent. Flambeau River Papers’ energy management approach has resulted in $2.6 million in annual energy savings and increased the production by 11.9 percent since 2006, when the mill was shut down as a losing business. Tasking the plant-level staff with the responsibility of making energy improvements may be an effective strategy and a natural approach, given that the workers on the floor are the most familiar with the plant processes. Flambeau River’s energy management approach underlies a successful business model for manufacturers looking to improve their profitability and competitiveness. 1. Discussion with Butch Johnson on November 2, 2009. 2. U.S. Census Bureau. “Population Finder: Park Falls, Wisconsin.” http://factfinder.census.gov/servlet/SAFFPopulation?_event=Search&_name=park+falls&_state=04000US55&_county=park+falls&_cityTown=park+falls&_zip=&_sse=on&_lang=en&pctxt=fph. Accessed November 6, 2009. 3. Flambeau River Papers. “About: The Mill?Flambeau River Papers.” www.flambeauriverpapers.com/about/the-mill html. Accessed November 9, 2009. 4. Energy Information Administration. “First Use of Energy for All Purposes (Fuel and Nonfuel), 2006.” www.eia.doe.gov/ emeu/mecs/mecs2006/pdf/Table1_2.pdf. Accessed November 10, 2009. 5. Energy Information Administration. “Table 8. Retail Sales, Revenue, and Average Retail Price by Sector, 1990 Through 2007.” www.eia.doe.gov/cneaf/electricity/st_profiles/sept08wi.xls. Accessed November 10, 2009. 6. Energy Information Administration. “Wisconsin Natural Gas Industrial Price (Dollars per Thousand Cubic Feet).” http://tonto. eia.doe.gov/dnav/ng/hist/n3035wi3a.htm. Accessed November 10, 2009. 7. Presentation from Flambeau River Papers on November 6, 2009. 8. Correspondence from Randy Stoeckel on November 23, 2009. 9. Discussion with Butch Johnson on November 2, 2009. 10. Correspondence from Randy Stoeckel on November 23, 2009. 11. Presentation from Flambeau River Papers on November 6, 2009. 13. Correspondence from Randy Stoeckel on November 23, 2009. 14. Presentation from Flambeau River Papers on November 6, 2009. 15. Correspondence from Randy Stoeckel on November 23, 2009.